saw this on offer in my local Morrisons (Festival Site, Stoke) had quite a few on the shelves & quite a few in people's trolleys! popped in to look at the TV's that I saw on this site...trying to upload a picture..
got a link to the deal then? not tryd it personally but ma wee bro has and said it was good. is this the one that you just pour on without doing anything? I have not washed my car in 4 years would this wash and shine it in seconds? The asda ones are 2l bottles - ive still got 3 bottles of it! Its not quite as easy as just pouring it on - you need to either dry it off manually (cloth), or drive it dry. I have found driving it dry leaves wet spots, but that may just be me doing something wrong (i wash the car first and apply this after the car is rinsed). The Asda 'any 2 for £5' are the smaller size...for 8 applications. I used it on Sunday, as long as you gave the car a good clean this does give a nice shine when poured over and wiped off.....not sure how good it'll be if you just drive off. So if you do want some this is a good deal. It is supposed to be a replacement for waxing the car, not an additional task after washing your car. The advert just says pour on and drive off, I was sceptical but the feedback in this thread sounds quite good! Can confirm it is a very good product and leaves a very decent shine with very little effort. You'll be pleasantly surprised with the results. Water beads off very well after this product has been applied. How are you guys using this stuff? Pouring on, or applying with a cloth/sponge? It's a quick fix to use instead of waxing your car. It causes water to bead (it's particularly good for windscreens, wing mirrors, etc). It's shinier than, say, not waxing at all but less shiny than a proper wax done right. How are you guys using this stuff? Pouring on, or applying with a … How are you guys using this stuff? Pouring on, or applying with a cloth/sponge? You mix it with warm water and pour it on. It's a quick fix to use instead of waxing your car. It causes water to … It's a quick fix to use instead of waxing your car. It causes water to bead (it's particularly good for windscreens, wing mirrors, etc). It's shinier than, say, not waxing at all but less shiny than a proper wax done right.Make sense? All it does is gives a "just waxed look". Unlike waxing, it offers your paintwork no protection. It is not a substitute for waxing your car, it only gives the impression for a while, that you have just waxed your car. It needs to be dried off with a chamois or similar or it will leave spots, as does your car after rinsing with plain water so it not an additional job other that pouring the Demon Shine over car. You can use a sponge but it'll make it sticky after use! I like it and have used it for at least 4 years when it started life in a more concentrated form 500ml / 10 applications. Now 5ltr only does 20, I guess the marketing boys thought people would think they are getting more for their money! Went to my local Morrisons petrol station today and put in £20 of diesel, picked up one of these outside and went in to pay. They charged me £22.98 in total. 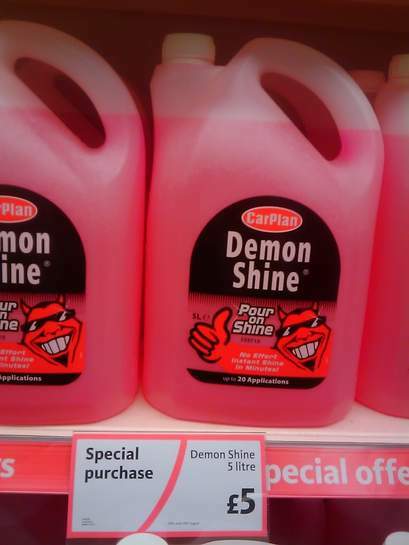 I checked my receipt to see if she had mis-heard the pump number but they had actually only charged £2.98 for 5 litre Demon Shine instead of £5. I went back in and got another one! It causes water to bead (it's particularly good for windscreens, wing … It causes water to bead (it's particularly good for windscreens, wing mirrors, etc). Apart from the fact that it says not to use it on glass! I use this product as a drying aid. After I have washed my car, I pour this all over the car to cause all the water to bead off meaning I spend only a couple of minutes drying the car instead 10 - 15 mins it would usually take with a microfibre drying towel. It does make the car look shiny, but as said, offers no actual paintwork protection. I like it and have used it for at least 4 years when it started life in a … I like it and have used it for at least 4 years when it started life in a more concentrated form 500ml / 10 applications. Now 5ltr only does 20, I guess the marketing boys thought people would think they are getting more for their money! I haven't used it for about four years. Does 5 litres only go for 20 applications? That's pretty weak compared to the original, if so! Although the original used to irritate my skin and make my fingers feel dry for about a day afterwards, so maybe watering it down at the source isn't such a bad idea after all? Apart from the fact that it says not to use it on glass!I use this … Apart from the fact that it says not to use it on glass!I use this product as a drying aid. After I have washed my car, I pour this all over the car to cause all the water to bead off meaning I spend only a couple of minutes drying the car instead 10 - 15 mins it would usually take with a microfibre drying towel.It does make the car look shiny, but as said, offers no actual paintwork protection. I agree with you there, and it's an advantage I hadn't thought about, it does make drying off the car quicker. I think they are being over cautious about the glass, I've never had a problem as long as I have dried off the windows before they get a chance to do it naturally which results in spots. this is actually reduced to clear now!